Insurance companies are recession-resistant and generate recurring and resilient cash flows. This makes them excellent candidates for lowering overall portfolio risk. Most also redistribute capital surplus via dividend payments and/or significant share repurchases. Some also issue preferred stocks and notes, allowing for higher yield. There are several interesting strategies for investing in insurers. In a series of articles, I will describe three different strategies along with named actionable examples. For this first article, let’s look at the DGI approach, one of the most common (but still winning!) approaches. Insurance companies are generally considered recession-proof; they tend to generate somewhat predictable and resilient cash flows regardless of the business cycle. They, however, still have risks, particularly certain types, it's just those risks have nothing to do with recessions or economic boom periods. For example, the non-life insurers generally are exposed to catastrophe risks and could be hit by significant and costly catastrophe events, like in 2017, with hurricanes Irma, Harvey, and Maria or in 2011 with the earthquakes in Japan and New Zealand. The life insurers, on the other hand, are exposed to financial risks (spread and interest rate risks) and non-financial risks (mortality and longevity risks). However, best-in-class insurers know how to deal with these risks and succeed to generate recurring cash flows. Cash flows which are generally redistributed to shareholders. Thus, insurance companies' securities can be good candidates to diversify and reduce overall risk for any high-yield or DGI portfolio. Many listed insurers are well-known for redistributing their capital excess to shareholders regularly by paying a quarterly dividend and/or repurchasing significant amounts of outstanding shares. Founded in 1955 by three brothers, Aflac (AFL) pioneered the introduction of policies which covered cancer after having identified an important need. The need to help quantify and lift some financial burden off cancer patients and their families. In the 1970s, Aflac went international, including selling insurance products in a key insurance market, Japan. Currently, Aflac is the largest cancer insurance carrier in Japan and generates more than $20 billion of revenues each year. They benefit from a leading position in Japan and the United States. Wherethrough the company is able to generate an extraordinarily resilient and stable combined ratio by active monitoring of risk incurred. With a combined ratio of 96.2% in 2018, Aflac generates an underwriting profit of $3.8 for each $100 in earned revenue. In total, the insurer enjoyed a pre-tax underwriting income of $0.9 billion. More importantly, as the massive sum of cash collected by the company (float) is invested each year, they generated an additional sizeable pre-tax return of $3.4 billion. This allowed the company to declare an FY2019 dividend per share of $1.08, about a 2.2% yield at current prices. While this is a low yield compared to other insurers, the overall payout ratio is low as well, only 30%. Thus, Aflac's current DCF yield represents a more respectable 7.3%. Furthermore, the excess cash is regularly returned to shareholders via share buybacks and dividend raises (3.8% this year). With more than 30 years of consecutive increases in its dividend, Aflac is also a Dividend Aristocrat. In fact, including dividends and share repurchases, the company returned $2.1 billion of the $3.4 billion in pre-tax return to the shareholders in 2018 with established plans to spend another $1.3 billion to $1.7 billion repurchasing shares going forward. At the current market capitalization level (about $32 billion), this represents an additional return in the range of 4-5.3%. Hence, the total return that shareholders could expect for 2019 would be in the range of 6.2-7.5%. For a very mature company, with low correlation to the market, this is not bad! Chubb Limited (CB) is the world's largest publicly traded property and casualty insurer. In 2016, ACE Limited (ACE) acquired Chubb for $29.5 billion in cash and stock. ACE adopted Chubb's more well-known name in the process. Providing commercial and personal property and casualty insurance, personal accident and supplemental health insurance, reinsurance and life insurance, Chubb is a balanced, diversified insurer, with leading commercial and personal lines in the U.S. The U.S. represented 63% of the total gross written premiums in 2018, with the rest being spread throughout Europe, Latin America, and Asia. Even as the company writes $38 billion of premiums every year, Chubb's real advantage, its DNA, is underwriting expertise. Except in 2017, the company has regularly delivered excellent underwriting profits, thanks to a low and well-steered combined ratio (the five-year average P&C combined ratio is an excellent 89.8%). Thanks to its underwriting expertise, this insurance company significantly outperforms most North American and global peers. 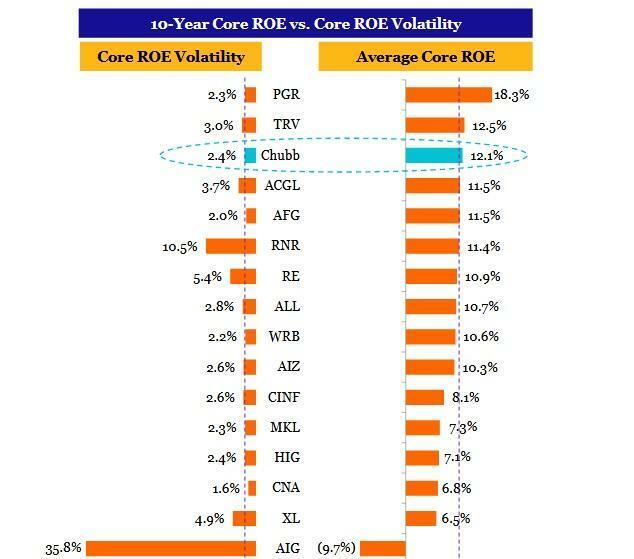 This helps Chubb's book value growth to also outperform on both a dollar and per share basis, while also maintaining an industry-leading risk/return profile. Over the last three years, Chubb's book value increased by 20% per share when peers' book value was flat. 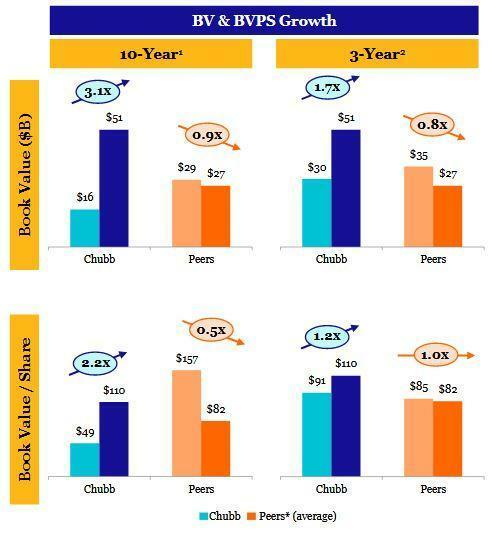 On a 10-year horizon, Chubb's book value per share has more than doubled, while peers' book value has actually been cut in half. Furthermore, the company maintained a high and stable Return on Equity 'RoE' over the years, putting it in the top 3 over the latest 10-year period. Generating resilient and growing cash flows, Chubb also redistributes its capital surplus by repurchasing shares and regularly increasing the dividend. In 2003, they paid $0.74 per share. By 2018, that payout totaled $2.9 per share (34% payout ratio). 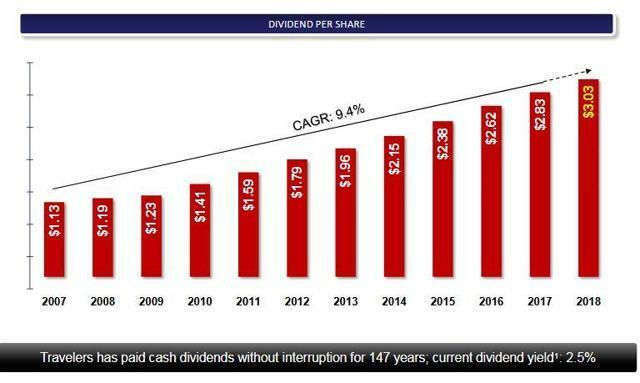 Thus, in 15 years, the dividend grew by more than 290% or a 5.6% annual average increase. Adding this to the current 2.7% yield, we get an expected forward return of 8.3%, again not bad considering their low correlation to future market cycles. Chubb's board announced that it will recommend to shareholders a 2.7% dividend increase at the company's 2019 annual general meeting, the 26th straight year with a dividend increase. During Q3 2018, Berkshire Hathaway (BRK.A)( BRK.B) initiated a position in Travelers (NYSE:TRV), purchasing 3.5 million of shares, or slightly more than 1% of the company. During the fourth quarter of 2018, Berkshire added another 2.4 million to that position. 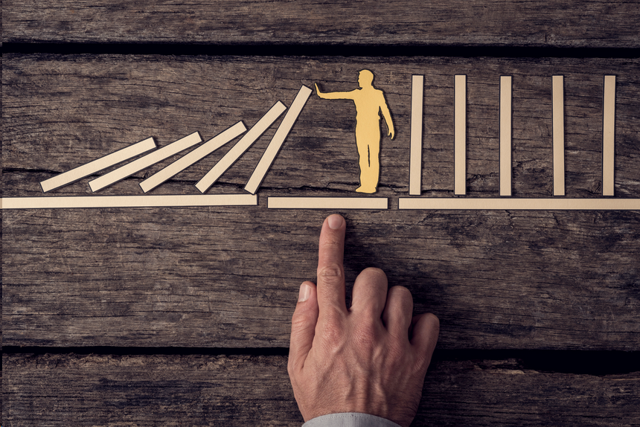 Berkshire Hathaway was attracted by the resilient operating performance of Travelers, which benefits from recurring revenues in its specialty segment. Thanks to a leading position in the U.S. and Brazil, the specialty branch delivers resilient, recurring, and stable cash flows. 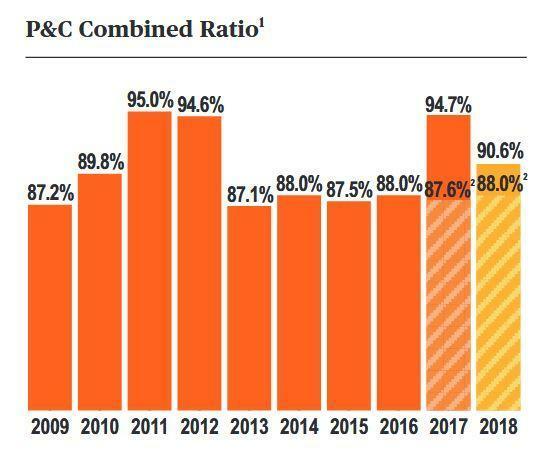 Over the years, the company's combined ratio has managed to remain below 98%, in spite of significant increases in catastrophe losses throughout the industry recently. As the company generates positive cash flows over the years, it invests its cash surplus. Hence, Travelers' investment portfolio is a second pillar of the company's success. In 2018, its post-tax investment income amounted to $2.1 billion. This cash generated by the insurance and the investment portfolios is also well utilized with an emphasis on redistribution to shareholders via share buybacks and the dividend. By repurchasing its shares actively, the company has succeeded in reducing outstanding shares by a remarkable 62% over the last 13 years. In addition to repurchasing shares actively, the company maintains a shareholder-friendly dividend policy which includes significant steady growth. 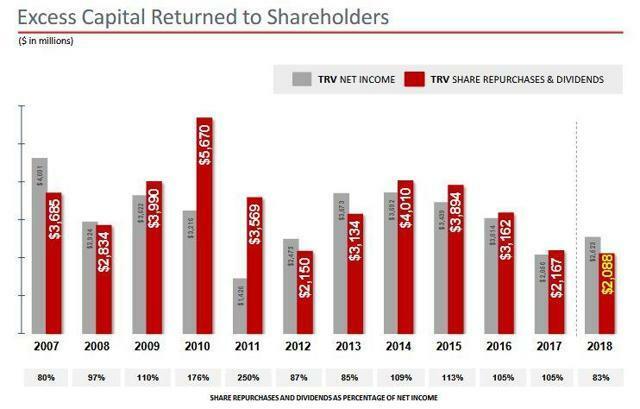 Over the last 13 years, the company has returned $42.0 billion to its shareholders in share repurchases and/or dividends, 117% of the current market capitalization ($35.9 billion). Just in 2018, the company redistributed almost $2.1 billion to its shareholders, 6.3% of market capitalization. Increases in the interest rates over the last year, and a normalization of underwriting margins in personal and commercial segments should benefit long-term shareholders via increasing dividends. Currently traded at around 1.5 times the book value, the company is not cheap. Below 1.2 times book would be a good target for long-term focused dividend-oriented investors. 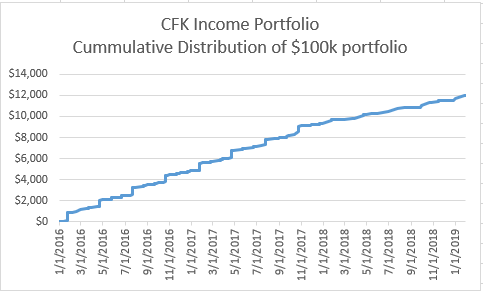 Cincinnati Financial (CINF) is a lesser known insurance dividend aristocrat whose underwriting excellence has been serving shareholders for over 58 years. However, generating $5.2 billion of premiums in 2018, Cincinnati is one of the top 25 U.S. insurers. 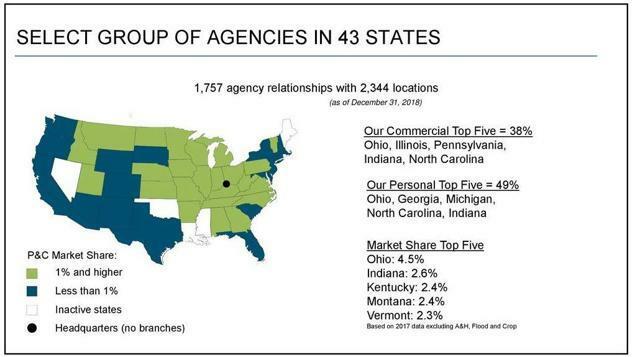 Thanks to its agency-centered business model (products distributed by independent local agents), the company has a local presence throughout the U.S. This can be a more high touch competitive advantage when compared to some of peers with less local in person representation. For the last five years, Cincinnati outperformed, with a better-than-average statutory combined ratio. Furthermore, the company increased its presence in niche markets, by acquiring MSP, Beaufort underwriting agency. This acquisition is expected to be accretive to earnings in 2019 and should support a further sustainable dividend increase. Regarding that distribution, Cincinnati has increased its annual dividend for 58 years running. In 2018, the dividend was not covered by net income due to losses related to a new securities accounting rule. Namely, unrealized investment gains and losses in equity securities are now included in net income. This will make net income reporting for insurance companies more volatile than it used to be, but should not affect operating income. Traded currently at around 1.8 times the book value, the company is more than fairly valued. At approximately 1.4 times the book value, I would become more interested. Well-monitored listed insurance companies succeed to generate solid and recurring cash flows and generally redistribute the capital excess to their shareholders. As the insurers might pay more premiums than they have received, one key of the dividend sustainability remains the operating performance, which could be assessed through the combined ratio for the non-life insurers. In the four examples detailed above, all the insurers have focused their efforts on maintaining a low and stable combined ratio, by writing low-risk policies or strengthening their presence in niche markets, where the underwriting margins were higher than in regular insurance markets. 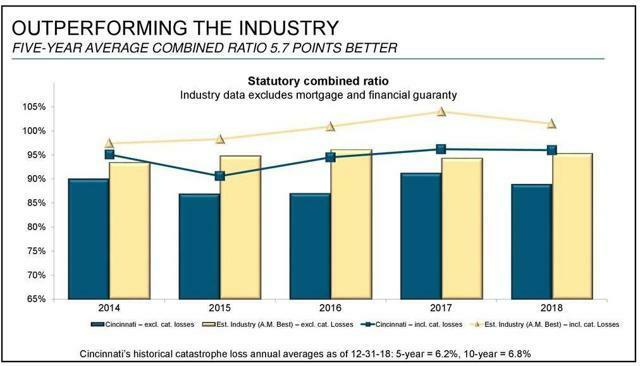 Combining double-digit organic growth with high underwriting margins is almost impossible on a long-term horizon (i.e., for the 15 or 20 next years) for mature insurers, like Chubb, Travelers, Cincinnati Financial or Aflac. That's why, these insurers have decided to focus on maintaining their margins by writing profitable policies, making accretive acquisitions, and investing the cash surplus for making growing the investment revenues. 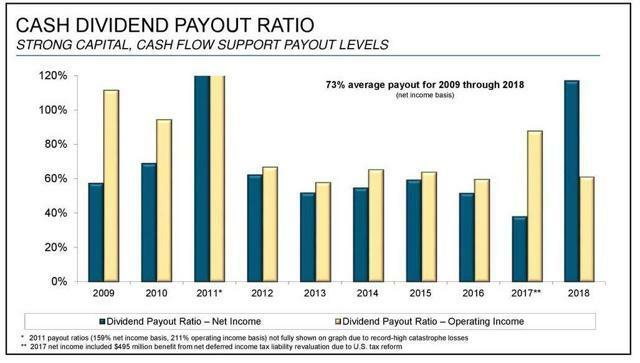 To reward patient shareholders, they used to repurchase outstanding shares and increase the common dividend every year. Hence, expecting an annual total return in the range of 5% and 7% on a long-term horizon is not a pipe dream with these insurers. Furthermore, dividend investors' portfolios will benefit from positive diversification effects and lower market volatility thanks to a low beta. In the next article, we will see alternative high-yield strategies to invest in insurers. Disclosure: I am/we are long AFL. I wrote this article myself, and it expresses my own opinions. I am not receiving compensation for it (other than from Seeking Alpha). I have no business relationship with any company whose stock is mentioned in this article.